This microscope image shows the high surface area of hexagonal-boron nitride foam glued together with polyvinyl alcohol. Image: Ajayan Research Group/Rice University. Materials scientists at Rice University have created a light foam from two-dimensional sheets of hexagonal-boron nitride (h-BN) that absorbs carbon dioxide. 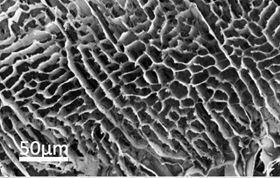 They discovered that freeze-drying h-BN turned it into a macro-scale foam that disintegrates in liquids, but adding a bit of polyvinyl alcohol (PVA) into the mix transformed it into a far more robust and useful material. The resultant foam is highly porous and its properties can be tuned for use in air filters and as gas absorption materials, according to researchers in the Rice lab of materials scientist Pulickel Ajayan. Their work appears in a paper in ACS Nano. The polyvinyl alcohol serves as a glue. Mixed into a solution with flakes of h-BN, it binds the microscopic sheets as they arrange themselves into a lattice when freeze-dried. This one-step process is scalable, according to the researchers. "Even a very small amount of PVA works," said co-author and Rice postdoctoral researcher Chandra Sekhar Tiwary. "It helps make the foam stiff by gluing the interconnects between the h-BN sheets – and at the same time, it hardly changes the surface area at all." In molecular dynamics simulations, the foam could adsorb 340% of its own weight in carbon dioxide. The greenhouse gas can then be evaporated out of the material, which can be reused repeatedly, Tiwary said. Compression tests showed that the foam became stiffer through 2000 cycles as well. And when coated with polydimethylsiloxane (PDMS), the foam becomes an effective shield from lasers that could find use in biomedical, electronics and other applications.